Comm-Link is a very affordable, modern extreme-area wireless communications solution for west Texas and southeastern New Mexico. It is an efficient, highly reliable wireless business solution for your Company’s dispatch and communications needs. Don’t confuse COMM-LINK with an old-fashioned two-way radio system. Any similarity ends at the microphone. COMM-LINK is a wireless voice and data system that will allow your dispatcher to talk reliably to any of your vehicles from southeastern New Mexico, to north of Lubbock, to the Big Bend and Trans Pecos to the Concho Valley – and anywhere in between. 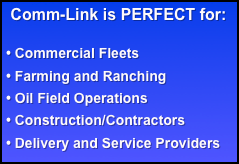 And to get the most from COMM-LINK equipment requires NO operator training! Cost Control – Comm-Link service is billed at a fixed monthly rate. Communication becomes budgeted, not estimated. No more runaway cellphone usage costs or lost phones. Wide Area Coverage – Comm-Link connects dispatchers or offices with each of your vehicles throughout our west Texas and southeastern New Mexico coverage area automatically – no switching channels or hunting for repeaters. Automatic Vehicle Location (AVL) – This optional feature offers instant automatic vehicle location using GPS technology. You know where your vehicles are at a moment's notice. Efficiency – Comm-Link allows total system customization to communicate with one or a fleet of vehicles – regardless of where they might be at any given time. Reliability – Comm-Link uses reliable, industry standard Kenwood higher-power equipment that works in areas where cellphones do not work or are unreliable. Ease of Use – Comm-Link equipment is as easy as picking up the microphone and communicating. The equipment does not take any specialized training to operate.